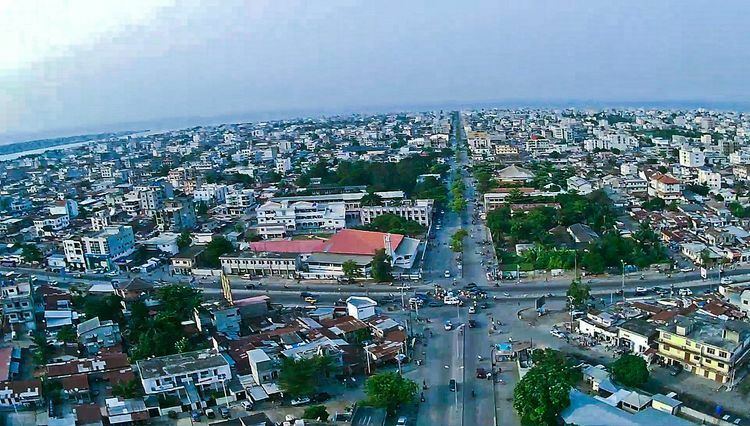 Cotonou ([kɔtɔnu]), is the largest city and economic centre of Benin. Its official population count was 761,137 inhabitants in 2006; however, some estimates indicate its population to be as high as 1.2 million. The population in 1960 was only 70,000. The urban area continues to expand, notably toward the west. The city lies in the southeast of the country, between the Atlantic Ocean and Lake Nokoué. In addition to being Benin's largest city, it is the seat of government, although Porto-Novo is the official capital. It is home to most of the country's government buildings and diplomatic services. The city is a major port and home to an airport and a railway that links to Parakou. Other features include Cotonou Friendship Stadium, Cotonou Cathedral, Cotonou Central Mosque, the Ancien Pont Bridge and the 20-hectare Dantokpa Market, which has a commercial turnover of over one billion CFA Francs a day. Another familiar feature is the motorcycle-taxis known as Zémidjans. The name "Cotonou" means "by the river of death" in the Fon language. At the beginning of the 19th century, Cotonou (then spelled "Kutonou") was a small fishing village. Though originally ruled by the Kingdom of Dahomey, in 1851 the French made a treaty with the Dahomean King Ghezo that allowed them to establish a trading post at Cotonou. During the reign of Glele, his successor (1858–89), the territory was ceded to France by a treaty signed on May 19, 1868. In 1883, the French navy occupied the city to prevent British conquest of the area. After Glele's death in 1889, his son Béhanzin tried, unsuccessfully, to challenge the treaty. From then on, the town developed quickly to become the largest harbour in the region. Cotonou is on the coastal strip between Lake Nokoué and the Atlantic Ocean. The city is cut in two by a canal, the lagoon of Cotonou, dug by the French in 1855. Three bridges are in this area. The Oueme River flows into the Atlantic Ocean at Cotonou. The city has established transportation infrastructure including air, sea, river (to Porto Novo), and land routes that facilitate trade with its neighbors Nigeria, Niger, Burkina Faso, and Togo. The erosion of the coast has noted for several decades. It worsened in 1961 following the major work undertaken in Benin with the construction of the Nangbéto dam and deep-water port of Cotonou. A pilot project funded by the United Nations Environment Program (UNEP) revealed that in 40 years, the coast to the east of Cotonou had retreated by 400 meters. This erosion has led many people to leave their homes along the coast. Under Köppen's climate classification, Cotonou features a tropical wet and dry climate, alternating with two rainy seasons (April–July and September–October, 800 to 1,200 mm (47 in) of rain per year) and two dry seasons. 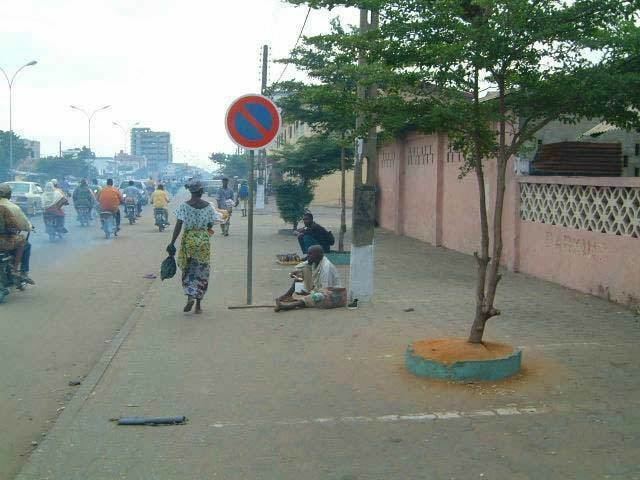 In December and January, the city is affected by harmattan winds. Temperatures are relatively constant throughout the year, with the average high temperatures hovering around 30 °C (86 °F), and average low temperatures at around 25 °C (77 °F). Besides French (the official language of Benin), the main languages spoken in Cotonou include Fon, Mina, Aja and Yoruba. The Autonomous Port of Cotonou is one of the largest in West Africa. The city is connected to Parakou in the north by the Benin-Niger railway. 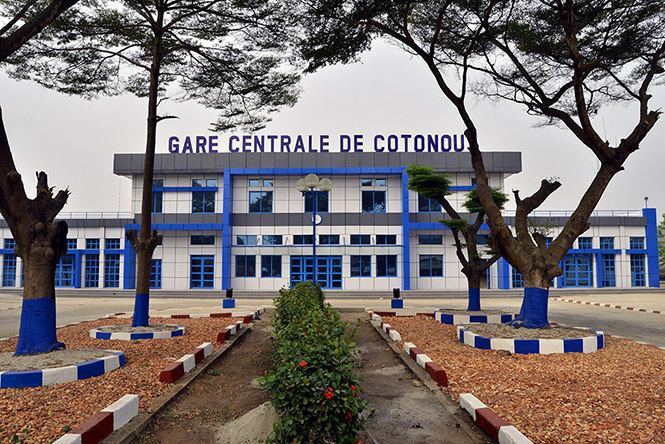 Cotonou International Airport provides service to the capitals of the region and to France, as well as the major cities of Benin: Parakou, Kandi, Natitingou, Djougou, and Savé. There are road connections to neighboring countries: Nigeria, Burkina Faso, Niger, and Togo. A prevalent mode of transport in the city is the motorcycle-taxi, Zémidjan. In 2015 a suburban passenger railway line was being developed between Cotonou and Pahou. Because of its status as a transport hub, Cotonou has become a crossroads of West African commerce, with much trade moving here from Abidjan because of the Ivorian Civil War. The city is a so-called "market town," enabling trade with the countries of the African interior, such as Mali, Burkina Faso, and Niger. In addition to the port, there is a free trade zone in the interior of the city for use by the landlocked Saharan states. However, the city is rife with corruption and illegal trade, especially with neighboring Nigeria. It can be considered the economic capital as it houses two-thirds of Benin's industries and is the headquarters of the nation's major enterprises and banks. Important manufactured goods include palm oil and cake, brewing, textiles, and cement. Motor vehicles and bicycles are assembled, and there are sawmills in the city. Petroleum products, bauxite, and iron are major exports. There are offshore platforms drilling for oil. The city is a center for the automotive trade, with European brands being sold from vast open-air parking lots. In the past, Citroën assembled cars (for instance, the Citroën 2CV and Ami 8) locally. By 2012, piracy in the Gulf of Guinea had significantly decreased trade at the port of Cotonou. In the Missebo area, Cotonou is a textile market of African print mainly handled by Indian wholesalers and retailers. Cotonou Cathedral or Notre Dame des Apôtres, near the Ancien Pont. It is noted for its distinct burgundy-and-white-striped tiles. The cathedral is the seat of the Roman Catholic Archdiocese of Cotonou. The diocese was originally created on June 26, 1883, as the Apostolic Prefecture of Dahomey from the Apostolic Vicariate of Benin Coast, Nigeria. After several names changes under Dahomey, on 14 September 1955 it was promoted as the Metropolitan Archdiocese of Cotonou. The cathedral was run by Archbishop Bernardin Gantin (died 2008) from 1960 to 1971. The Office de Radiodiffusion et Télévision du Bénin (ORTB) — the national television and radio operator — is based in Cotonou.